You don’t have to be out of your comfort zone all the time! In the manic modern type A world we tend to worship growth and goals. 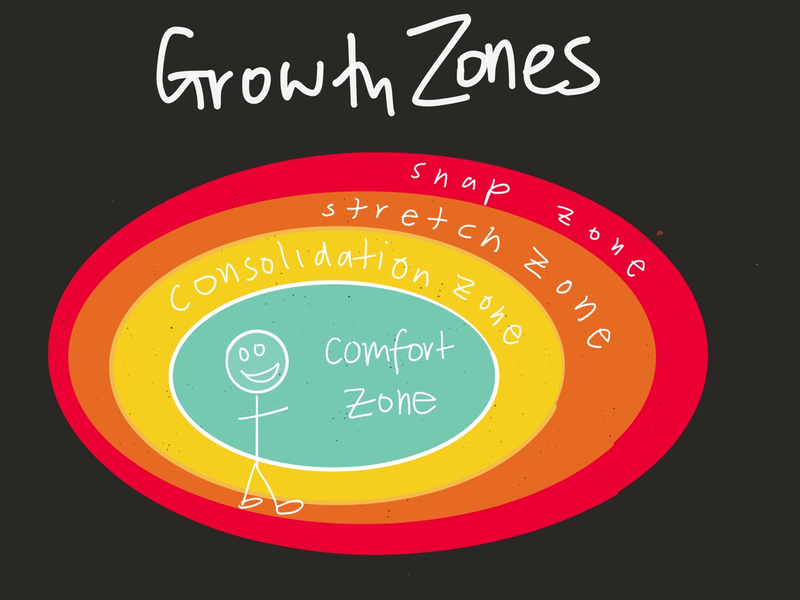 In this post-Dale Carnegie era we have learned to worship being out of our comfort zone and “stretching ourselves” — being in what I’ll call a stretch zone. It’s all about working harder, training harder and so on. There’s always encouragement and advice to “get out of our comfort zone” which those of us who are more type A tend to follow. However, after doing that for most of my life— now I’m thinking that it’s not that simple. Time in a different zone, a zone of consolidation, is crucial. There are a bunch of different models out there on this, but I find it most helpful to draw on parts of each and consider four zones — the comfort zone, consolidation zone, stretch zone, and snap zone. Being in a comfort zone can be described as being “in a state in which one feels familiar, safe, at ease, and secure.” A state where you feel comfortable — whether that be a physical state or an mental state. The comfort zone is by definition routine, and unchallenging. It can be a place of atrophy. When you leave the comfort zone, you enter the stretch zone. 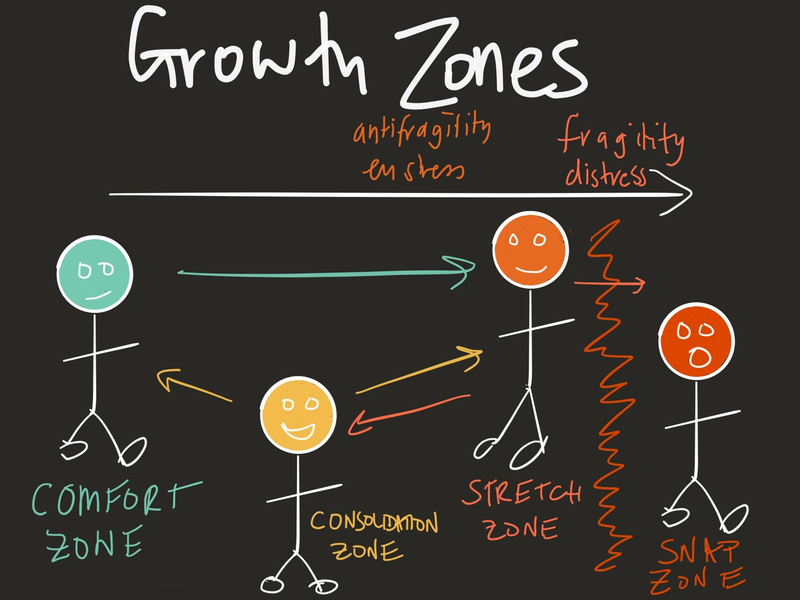 This is the zone where growth is triggered. You are no longer in perfect comfort. In fact, you are often uncomfortable, because it is the zone of eustress and the zone of hormesis and possibly antifragility. To stretch mentally is similar. You push your mental boundaries, maybe it is practicing a new skill. It’s that repetitive and grueling struggle to learn, and often includes deliberate practice. It’s important to mention that if you go to the edge of your stretch zone, you reach the snap zone. Anyone who ever injured themselves “overdoing it” with some kind of physical activity would have entered the snap zone, or anyone who can recall a time of burnout also likely hit the snap zone. Nietzsche was definitely pointing at antifragility when he said — “that which does not kill us, makes us stronger”. Nietzsche was correct, but only to a certain extent, we need to make sure we stay out the snap zone. After we’ve been in the stretch zone, for example when doing physical activity, our muscles and connective tissue then adapt to that stress and even over compensate, they go further than necessary in adapting. Any good personal trainer will tell you, if you work your back muscles hard one day, you should rest them the next day and work on your leg muscles instead. They will tell you the importance of rest (consolidation) periods. Stretch then consolidate. Your muscles don’t grow during the exercise, but they grow during the recovery period — consolidation. We are antifragile, we get stronger after a certain degree of stress. Stretching mentally is no different. You stretch and learn a new idea, and you need to sleep on it. During sleep you consolidate your learning. Many of us chronically spend too much time in the stretch zone, it’s not uncommon for us to experience burnout or injury when reaching the snap zone. Thus, spending time back in consolidation is as important as the stretch zone. Consolidation can be considered in a more macro or longer term way as well. If some major event happens that affects you physically or mentally, I’ve noticed I need longer periods of consolidation. Some major learning, a big jumps or changes. These take time to assimilate, and the body and brain needs time to consolidate. I’m still getting out of my comfort zone, but definitely making some time in consolidation compulsory!